Thanks to everyone who came out to our Charlotte Helpers prayer vigil for July! Fr. Hoare gave us a beautiful prolife homily at St. John Neumann and afterwards led us in a prayer procession to Latrobe abortion mill. There we prayed decades of the Rosary and sang hymns. Thank you Fr. Hoare, for leading a beautiful vigil, we know that somewhere conversions took place and babies were saved. Thank you to everyone who came to our event last weekend. I think it was one of the more spiritually intense times on the sidewalk. As Fr. Hoare led us in prayer, a couple parked on the road next to us instead of in the clinic parking lot. They were there for an abortion. We watched and prayed as the sidewalk counselors tried to talk to them and lead them to the ultrasound bus. They were Hispanic, and none of the sidewalk counselors could speak Spanish. One of the nurses with the ultrasound bus came over to our group and asked if anyone spoke Spanish and if we could help talk to them. This was the first time our group was asked to help counsel. It was a desperate moment. They had only a short window to reach out to this couple as they were walking aimlessly towards the clinic, then past the clinic, and then back towards the clinic. No one could adequately communicate with them. No one with our group spoke fluent Spanish, though one woman from our group and even Fr. Hoare made an attempt to talk to this couple. We watched all of this happen right beside us as we prayed vocally. The window closed and the workers led the couple inside the abortion clinic. After they entered, one of the bouncers came right where we were praying with a lawnmower. She began mowing the patch of grass on the sidewalk where we were standing, drowning out our prayers. This was clearly a tactic of the devil, as Fr. Hoare undoubtedly realized. This happened at the time we were supposed to leave, and he said, “we’re staying.” We continued the rest of our rosary as she mowed the grass. 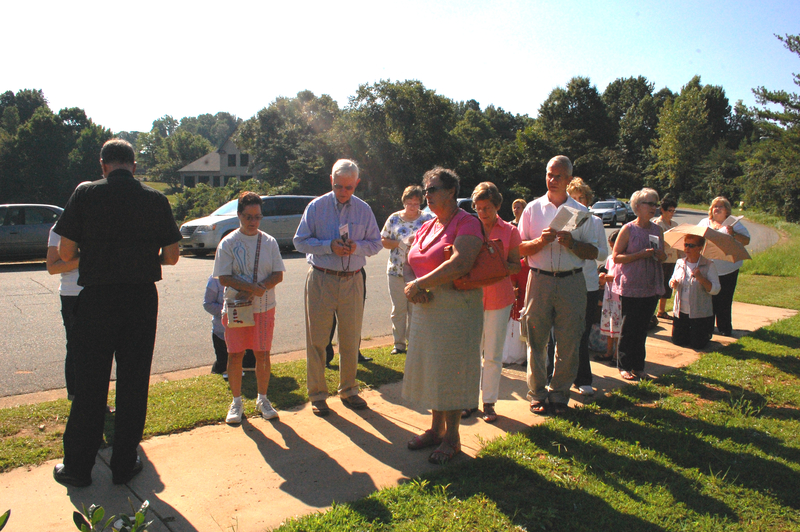 Also on the sidewalk was the EPIC group, a group of home-school Catholic teens who pray at the clinic once a month. They were there before we arrived and stayed after we left. It was hot day and they were standing in a row in the direct sunlight. What an inspiration these kids were that day. As I left I passed by the clinic parking lot and noticed that it was almost completely full.